Do you have a little princess with a birthday coming up? Why not delight her with one of these princess themed parties in New York? Little girls love getting dressed up and they will love when a costumed princess comes to celebrate their birthday with them! Choose from among these princess parties in New York and make your little girl's day by using our guide! 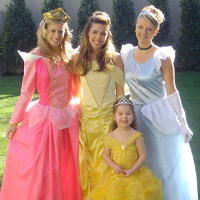 KidsParties.party is another great resource for finding princess party entertainers in NY. Have a Princess Lead the Party! Miss Christine will give your little princess an unforgettable party when you hire her to come entertain at your child's next birthday. She can come dressed as your child's favorite princess from Snow White and Cinderella to Pink Princess and Arabian Princess. Have your child and party guests get dressed up too for extra fun! Miss Christine will lead all the princesses in dance games, music and an interactive show. She will do balloon twisting and beautiful face painting for each of the guests. Miss Christine can be booked for one or two hours - she brings her own professional sound system and themed backdrop. When you book your princess party with NY Princess Parties you will be able to fully customize your party package to ensure it is exactly what your little girl wants. You can choose which princess you would like to run the birthday party from Cinderella and Princess Beauty to Pocahontas and the Green Fairy Princess. If there are going to be boys at the party too, choose to have a second costumed character come as a prince, hunter or pirate! The princess will lead your guests in activities such as party games, hair braiding, jewelry making or crown decorating. You can add on extras as you desire including goody bags, face painting, glitter tattoos and much more.When you have these professionals run your party, you can sit back and relax. Some of the Top Princess Entertainers in NY! When you have A Princess Visit entertain at your child's next birthday party each guest will have an unforgettably fun time. Choose from several princess packages depending on what types of activities you'd like to include or create your own custom package. Princesses that can come run the party include Cinderella, Beauty, Snow White, Sleeping Beauty and Pretty Purple. These professional entertainers can also come as fairies, mermaids or other fun characters. Have all the guests come dressed in their most royal clothes to enjoy this party to its fullest. These princess entertainers are professionals at what they do and your birthday child will be sure to remember this special birthday celebration for years to come. Have a Princess Come to your Home! Daisy Doodle is a professional entertainer who has been delighting children with her princess appearances for over 15 years. She will come entertain at your daughter's NY princess theme party dressed as your choice of Pocahontas, Ariel, Snow White, Cinderella, Esmeralda, Jasmine, Belle or Sleeping Beauty. She will do glamorous face painting on all the little princes and princesses at the party and will lead fun games and dances. 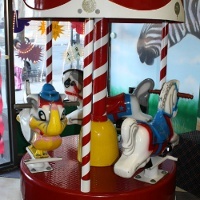 Several craft and game choices are available and Daisy can gear her entertainment toward age groups as young as toddlers. She also does a fantastic Princess Magic show that delights children from start to finish. These great princess parties in NY will come to the location of your choice and treat your little princess and her guests like royalty! Several different party themes are available - choose from Wonderland Tea Party, Under the Sea Party, Princess and the Frog Party, Princess and Pirate Party and much more! 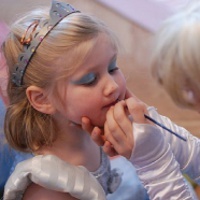 Parties can include appearances by princesses, makeovers, hairstyling, related craft, games with prizes and much more. Many add-ons are available so no matter what package you choose you can customize it to make your little girl's day extra special. Make Her Dreams Come True! 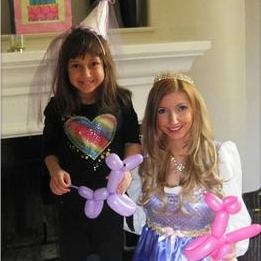 Plan your next party with a princess to come and entertain your little girl and her guests. This princess can come dressed as Cinderella, Princess Aurora, Beauty, Snow White and more! You can choose from three different packages when you have Your Party With a Princess do the entertaining. All packages include balloon twisting, a tiara for the birthday girl, princess stickers and sparkle rings for all the princesses, and musical dances and games. Upgraded packages come with even more time with the princess, more games and more fun! For something truly different, throw your little princess a princess pony party! When you use Mindy's Parties to celebrate your child's birthday each guest will get a chance to wear their prettiest princess outfit and ride an adorable pony. 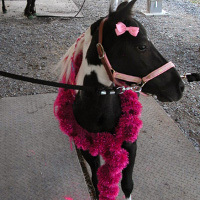 Even the pony can be dressed up in princess style! Bring the cake and some decorations to hold your entire party in Mindy's barn. Parties can take place rain or shine due to the large indoor facility available. 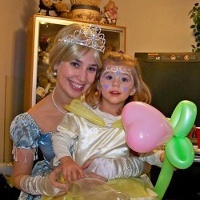 When you have one of these great princess parties in New York your little girl will never forget it! All Inclusive Pirate and Princess Party! 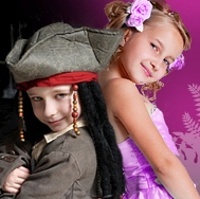 Make your daughter's next birthday party a pirate and princess themed party in New York! Funtasia is a great party facility that offers several types of party packages and themes which are great fun for children of all ages. When you book a princess and pirate party Funtasia will take care of everything. Three party experts will run the party for you so you can relax and enjoy your child's fun day. Costumes will be provided for each guest - which they get to bring home as a favor! 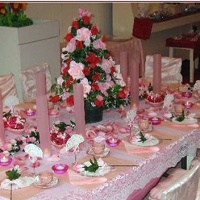 Food, decorations, cake, gift bags, party games, a party craft and much more are included in this fun party package. All the children, both boys and girls, will have a great time playing on the game systems, bouncy house, and soft play jungle gym at Funtasia! What girl doesn't dream of being a princess when she's young? Indulge your little girl's dream by throwing her a New York princess themed party! Ritzy Glitzy Girlz Club is a party service that will come right to you to throw the party. 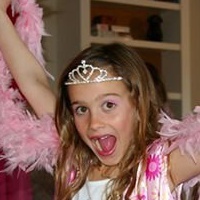 When you choose their Ritzy Glitzy Princess party option all the little girls at the party will have a blast. Glittery makeup, manicures, hair styling and many princess outfits in which to dress up are all provided - you just provide the location and the food! Party specialists will run the party for you and will lead party games, a fashion show and spectacular photo shoot. Have your princess party in elegant style at the Pelham Music Arts Studio. Parties at this musical venue include a musical presentation, arts and crafts, food, cake and party hats. When you choose the Princess Tea Party theme each girl can come dressed in their best princess dress and can accessorize with the boas, shoes and accessories that are provided. The tea party table will be decorated in a beautiful lace tablecloth and roses, and the princesses will learn about the proper etiquette necessary for every princess. This NY princess tea party is lots of fun for all! Princesses and Pirates, Oh My! Have a princess party for both boys and girls when you book your little girl's party at the Birthday Zone. Not just any princess party in NY, this one includes pirate dress-up for the boys! Kids will have fun getting dressed up in the accessories provided at the Birthday Zone and participating in expert-led activities, games, songs and dances. Each party includes food and drink, activities, balloons and face painting with options to add on crafts, cotton candy, pinatas and more! You just bring the cake and the guests and they'll have a blast!